Welcome to Prague Daily Photo! Hope you're enjoying the Daily Photo blogs' Theme day for the month of September. This light is right in front of the Prague Castle overlooking the whole Prague (really a lovely place :). The signs will guide you to Prague Castle (the left one) and to Charles bridge and the church of St. Nicholas (the right ones). Well, you can get to Charles bridge even if you go to the other side. It is as simply as going anyway down from the hill Prague Castle stands on. 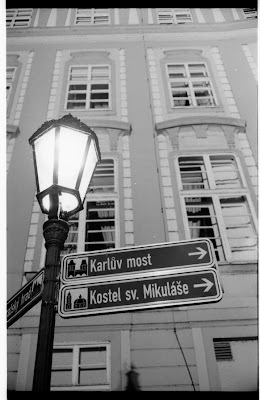 Picture taken with Canonet QL17 (as well as a lot more here at Prague DP) and Kodak Tri-x.